Founded in 2014 by artists Adam D. Miller and Devon Oder, The Pit is a contemporary art gallery representing emerging and mid-career artists who work in a variety of mediums. The Pit also organizes wide-ranging group exhibitions both in-house and off-site and publishes an ongoing series of Risograph artists’ books and editions. 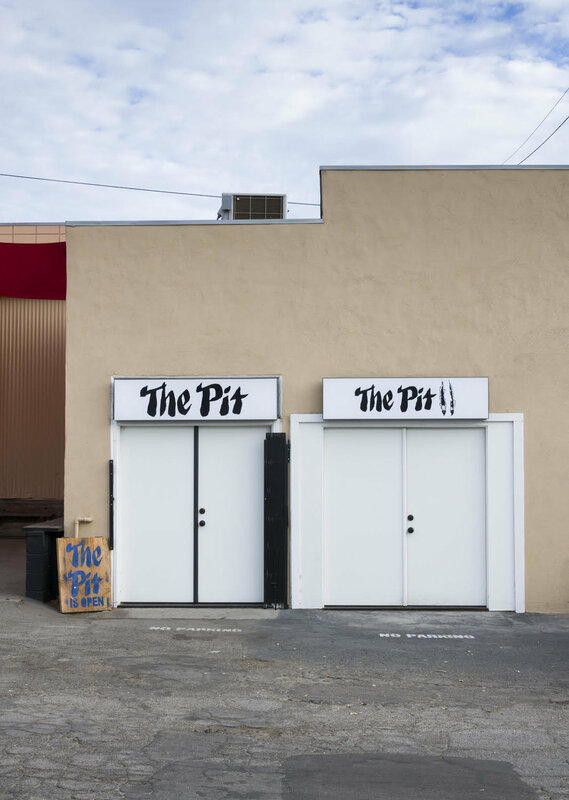 Housed in a former mechanic's shop, The Pit comprises a zine shop and three exhibition spaces: The Pit, The Pit II, and The Pit Presents, a new initiative of gallery residencies and exchanges that will debut in November 2018. The Pit is a gallery member of New Art Dealers Alliance. Adam: Once the gallery reached a certain point I was able to quit my day job, which really changed my studio practice. The gallery is attached to my studio so when I’m working at the gallery I’m also able to get more studio time. Prior to running the gallery, I’d always be collecting materials and making sketches leading up to when I had time to be in the studio to execute a painting or print. Now that we have The Pit I’m able to make work in a more spontaneous method, and I make something everyday even if it’s just a small drawing. Devon: Running a gallery has really changed my studio practice. I’ve benefited from the dialogue and community of other artists. Continually looking at art, talking about art and doing so many studio visits has given me more inspiration and freedom in my own work. We are artists, run a gallery, and are parents to a two year old, so time management is key. I’m much more efficient in my studio now and my workflow is more deadline oriented. What are some of the unique and defining conditions that you work under in LA? We have a really wonderful space in Glendale that would be hard to come by in another city. Our landlord has owned it for over fifty years and loves that artists are working in his building therefore he is flexible and generous with how we use the space. We have two studio spaces and a bookshop attached to our two gallery spaces, The Pit and The Pit II. We recently took over three more one car garages in our building, converting them into another gallery space that we lease out to Ruberta, a gallery collaborative shared by five galleries from Mexico, Guatemala and Colombia. LA has great energy right now with a lot of artist-run spaces opening up all over town. Although we are a bit out on our own in the industrial part of north Glendale, people make the trek to see our shows and participate in the community. This has allowed us to have a large multi-functional space with a low overhead. I’m curious about how the collaborative nature of The Pit works. I imagine at times your individual interests support each other’s and that at others it creates some degree of friction. Is this the case? Adam: Devon and I work really well together. We have different speeds at which we work. I like to move really fast and get things booked, and set up projects, etc. and Devon is more detail oriented. She makes me slow down and reconsider decisions. It makes for a really smooth working relationship. Our general interests are similar, but sometimes our aesthetic interests differ which I think helps make the program more diverse and not one note. If I have a deadline for a show of my own work, Devon takes more of a lead at the gallery and vise versa. You guys recently opened The Pit 2. How do the two spaces function in relation to one another? In our first few years, The Pit was primarily a space for group shows that we curated or were curated by other artists. When we opened The Pit 2, we intended it to be a space for more immersive installations and intimate solo shows. The Pit 2 has been open for two years now. It has been a great space for artists to take over and not feel the pressure of a really large gallery due its small size. That said, we've enjoyed working on more solo projects over the years, and so now have solo shows in both spaces. What is an early moment in your life when you did something that now resembles curation and exhibition production? Adam: While in high school in Stockton, CA, and then afterwards while getting my bachelors degree in Sacramento I was very involved with the punk and garage music scenes. We had a real DIY approach in that we booked all our own shows, made our own records, screened our shirts, designed and printed our own stickers and posters, etc. Before opening The Pit and after grad school I started organizing group shows at alternative spots in Los Angeles. or every exhibition we’d make a zine to accompany the show, and then send them out to other spaces to get more opportunities to organize more shows. After about 5 years of this, we decided to open The Pit and our approach really goes back to my time in music and DIY culture. Devon: Prior to opening the gallery, I taught photography at a non-profit, The Armory Center for the Arts where I learned photography as a kid. I worked in the education department at LACMA organizing classes and events. 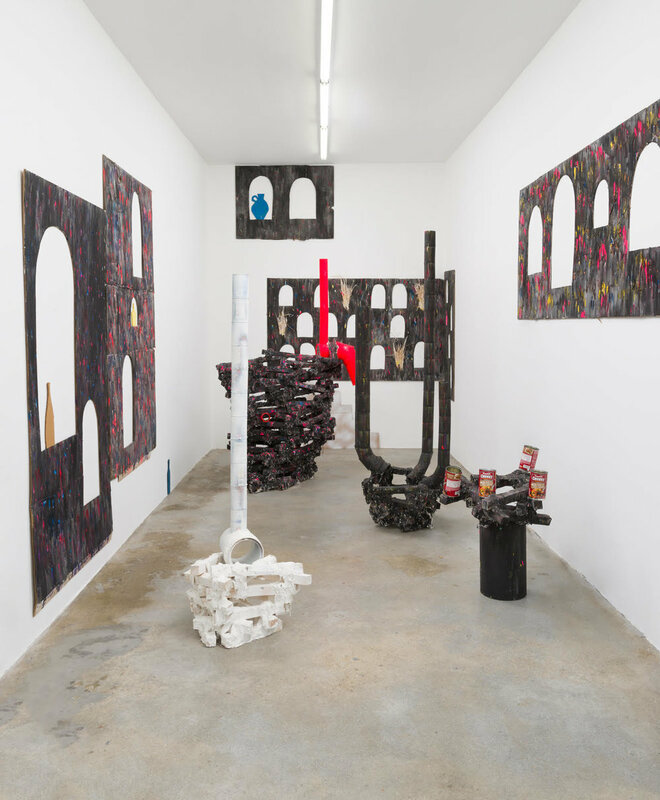 For seven years I was the archivist for artist Sterling Ruby and I had a contract job at Mark Bradford’s non profit space Art + Practice where I worked on a specific project archiving the amazing, long history of the artist-run space, The Brockman Gallery. All of this experience led me to run a space like The Pit. Working with inspiring kids in the early years, to doing gallery relations and administrative work at a busy artist studio and lastly archiving years and years of exhibitions for The Brockman Gallery archive, seeing where artists like Noah Purifoy, David Hammons, Elizabeth Catlett and others got their start. What are some things a visitor experiences in the physical gallery that wouldn’t register over a phone? We always tell people that it’s hard to understand the Pit without visiting The Pit because it is a unique experience. We make a point to be warm and welcoming, interacting and speaking with everyone who comes here. Then, as we mentioned previously we have the two galleries, a zine shop that also sells t-shirts and artist editions, often times the studios are open and people can peek into them too. We like to have the whole space open to visitors. When you visit the gallery, you will walk through our studios, the zine shop and you often will see us making the books on our Risograph in the back room. The location of The Pit is actually quite spectacular too. We’re kind of hidden in a small street behind other businesses so we’re easy to overlook but we are right off the LA River and on either side of us are spectacular views of Griffith Park and the Verdugo hills. How do you engage collectors? We really believe in the work that we show and we feel that’s infectious. We feel lucky that collectors have come our way due to our program and we’ve spent a lot of time trying to build and foster those relationships. We also participate in traditional gallery practices like art fairs and reaching out directly to collectors and consultants. Social media has been very beneficial to widening our collector base as well. We curate shows in other cities, do gallery swaps and try and build our collector base through our broadened visibility and activity outside of Los Angeles. At our gallery, we love welcoming in non-profit groups, museum groups, people who are interested in learning more about contemporary art and people who are interested in getting involved with our community. We throw additional events throughout the year to engage with a wide variety of different people such as readings, screenings, benefits, etc. How have things changed over the last four years as the gallery has gained traction? What do you do to breathe new life into the grueling nature of the work? The gallery has continually changed over the past four years. When we started we were open by appointment only, and every project was a group show—half of which were curated by other artists, artists we had long admired and respected. As we gained traction, and started doing solo shows and fairs, our approach to the gallery shifted a bit. We started thinking how we could help artists long term and try to continually come up with creative ways to support artists. We introduced a roster of represented artists about two years ago. For us, I think we keep the model changing and are always trying to expand the space and our reach. Bookmaking has always been a part of the programming. We used to make a zine for every exhibition on our in-house Risograph. Now we are focusing on more artists’ books and releasing them every couple of months. We do twelve shows a year here at the gallery, but also curate exhibitions at other spaces. Last summer Adam organized a large 18-person exhibition at a non-profit arts center in Northern California, and in May we’re launching Vision Valley, a group show of thirty-two artists working or living in the region, at the Brand Arts Center & Library. We also continue to facilitate gallery swaps with other spaces. We are continually trying to change our current set up and create new avenues and ways to do exciting exhibitions and reach a new audience. Also, we recently brought on our director Corrina Peipon, who is an artist herself and brings with her years of museum and gallery experience previously working as a curator at MOCA and the Hammer Museum. With every new show we have at the space there is an excitement that keeps us passionate. Our openings are huge celebrations that really give us inspiration and energy to keep it all going. We feel so lucky to be able to work with artists in such an in depth way. To find out more about The Pit check out their website.